Congrats to all of the 2013 New Year Brides that just recently wed last week! Hosting a wedding on new years eve can be a big project to take on! The expectations, expenses and stress seem to be higher, but the reward is of course you are throwing the party of the year! Are you considering a big New Years Eve Bash for your wedding? Send out your save the dates 9 – 12 months before your wedding, to give your guests enough time to plan. This is a busy time for family vacations and new years plans so the sooner your guests know about your event the better! 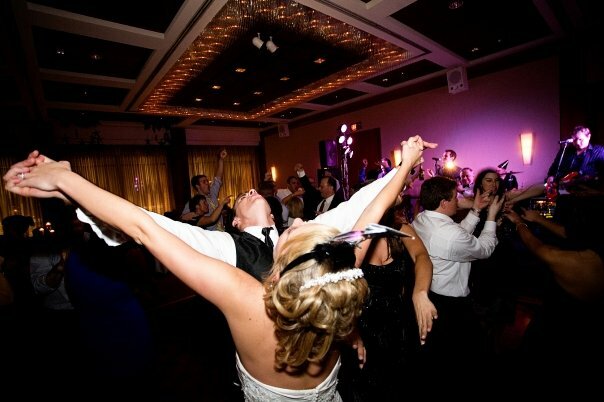 One of the biggest pros to having a wedding on new years eve is it’s going to be a big bash. Invite a lot of people and make your wedding the place to be when the ball drops. Everyone will count down until to new year together. Give your guests wacky glasses and fun noise makers to ring in the new year. Pick your favorite live band and have them rock out until midnight, keeping your friends dancing on the dance floor! If you want your guests to come to your wedding expecting a party, New Years Eve is the night for you! During most weddings you might lose a group after the cake cutting or first dances, on new years eve a higher percentage of your guests will hang around to party until midnight. Make sure you have snacks and drinks all night to keep your guests energy high, dancing, possibly a photo booth to entertain your guests and spread out your special events/songs throughout the night to keep everyone guessing what’s next. Most of your friends and family will be glad to have their new years plans set so early in advance and you will have a high yes response rate since your guests will hopefully have vacation time to take off at the end of the year. With their plans set early, parents can set up babysitters, friends can book hotels rooms and family can arrange their holiday time. Hosting a new years eve wedding makes your friends and families plans easier! Remember when I mentioned about the high yes response rate? With that will come high expectations for a big new years eve bash. If you are offering an open bar (which on New Years it will most likely be expected), plan on adding extra hours to your bill to extend the open bar and pay for the extra bartenders and servers to stay around all night. A fun addition to late night weddings is midnight snack bars. Plan to bring in mini appetizers around 11:30 pm to keep your guests fed and the energy at your party high! Even if you get your save the dates out with enough time, unfortunately some of your friends will have yearly plans that they can’t get out of. If there are certain people who you don’t want to miss your wedding, check with those specific people before setting your date so you make sure they can attend. New Years Eve is a big night to host parties, expect to pay for it! Don’t be surprised if the food, services and especially your venue has a higher charge. Your hosting the party of the year, don’t let money prevent you from hosting the wedding of your dreams! Since you will expect to pay more for the food and service, really prioritize the rest of your expenses. Look for how you can cut costs in areas that don’t matter, so you can spend more on the great party! Which side are you on? Do you think a new years eve party would be a fun event or just too much to plan! ?